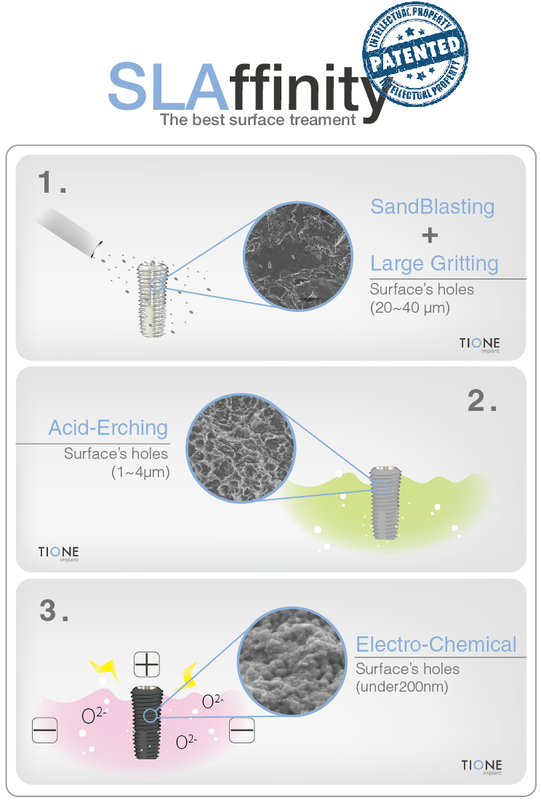 TIONE dental implant features a state-of-art SLAffinity® Technology, which leads to greater stability at initial stage and then faster Osseointegration. SLAffinity processes inherited the SLA surface treatment and then modified by three steps; 1. Sand-Blasting+Large Gritting（20~40µm）2. Acid-Etching(1~4µm) 3. ElectroChemical (200nm). 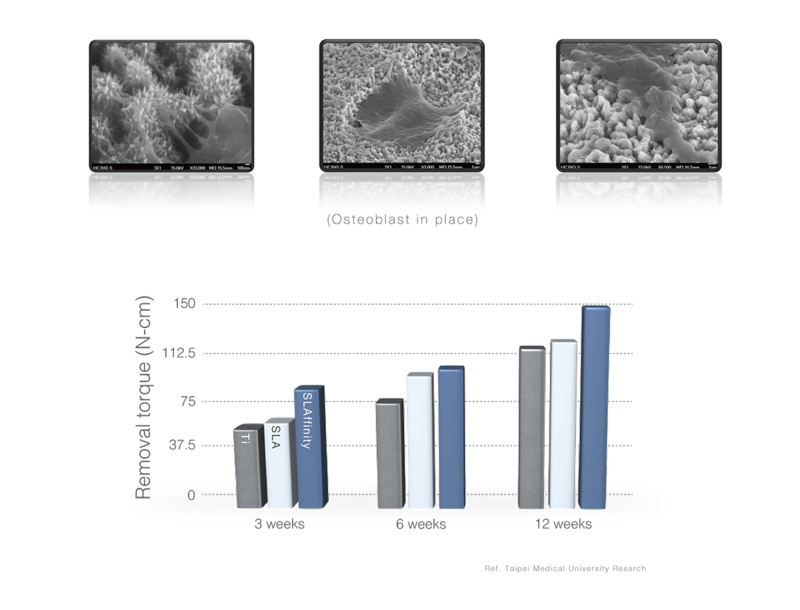 This technology create the oxide layer on implant surface. In addition, it bring high Hydrophilic and faster Osseointegration benefit. Thirty male Lanyu small-ear pigs (age, 12±0.2 months old; mean weight, 55±0.6 kg) were chosen, Under general anesthesia, three implants after sterilizing by steam autoclaving, one from each group, were randomly inserted into the edentulous mandible site in a pig using a standard surgical procedure. After healing periods of 3, 6 and 12 weeks, 10 animals for each period were monitored by X-ray and then sacrificed using an overdose of anesthetics. The 90 bone blocks containing the implants were harvested. 36 blocks were used for the histological analysis, and 54 ones were used for removal torque test. Clinical Study in 40 Patient from Shuang Ho Hospital and Taipei Medical University Research, by using TIONE dental implant system. Volunteer recruit, in total 40 patients, 20~45 years old male，10 person; 20~45 years old female，10 person; more than 46 years old middle-age male，10 person; more than 46 years old middle-age female，10 person. 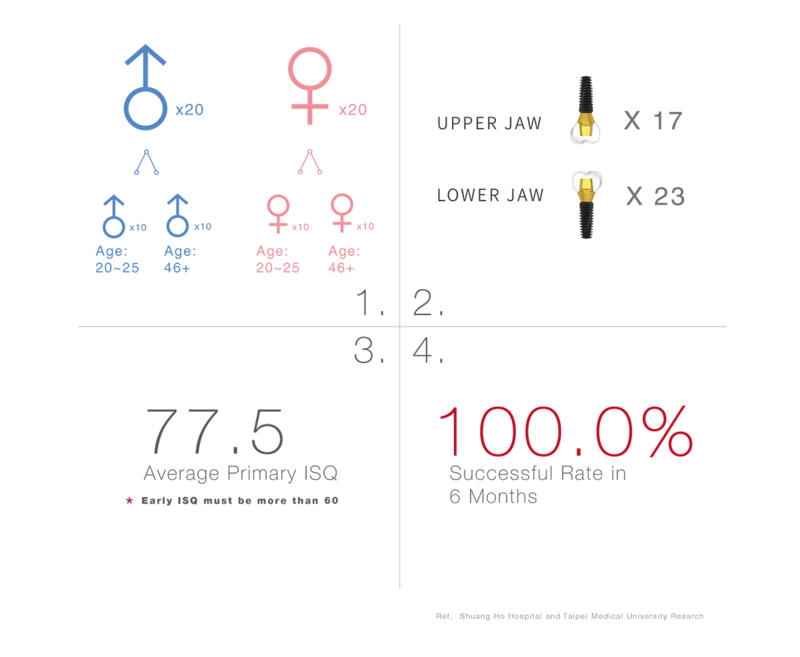 Used 40 implants in total, 17 was placed in upper jaw other 23 was placed in lower jaw, the ISQ reached to 77.5 at the beginning, after 6 months there was no implants failure, the successful rate is 100% from this study.